Part of our success as Asia’s Boutique Airline comes from listening to our passengers' suggestions. Many have asked about a Bangkok Airways’ business class, and in response, we have created our exclusive Bangkok Airways Blue Ribbon Club. The name speaks for itself--Blue Ribbon Club signifies top-notch quality. For those who are wondering how we can improve upon our renowned “boutique serve”, let us show you how Blue Ribbon Club have raises our exclusive service concept to the next level. From your arrival at our check-in counter to your arrival at your destination; Bangkok Airways Blue Ribbon Club is as good as it gets! As part of our Blue Ribbon Club exclusive and personalized service, our staff will always be on hand to assist you in order to make your travels more comfortable and enjoyable. Relax in style and comfort at our personal Blue Ribbon Club passenger lounge. Enjoy complimentary snacks and refreshments, as well as surf the internet, free-of charge, from one of our computer terminals. Enjoy wide and spacious seating with plenty of leg room when traveling with our Blue Ribbon Club. This is a place where you can relax, or catch up on work with ease. With our Blue Ribbon Club menu, you will enjoy a variety of savory menu selections ranging from thai, asian, and Western dishes. Complimentary wine and champagne are also available. Members of our FlyerBonus frequent flyer program will receive extra mileage when flying with Blue ribbon Club. 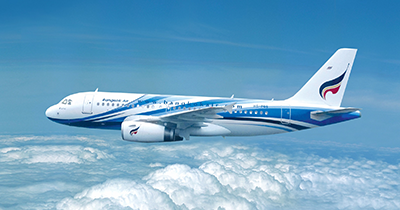 Go ahead and treat yourself to more of the great perks that Bangkok Airways has to offer.